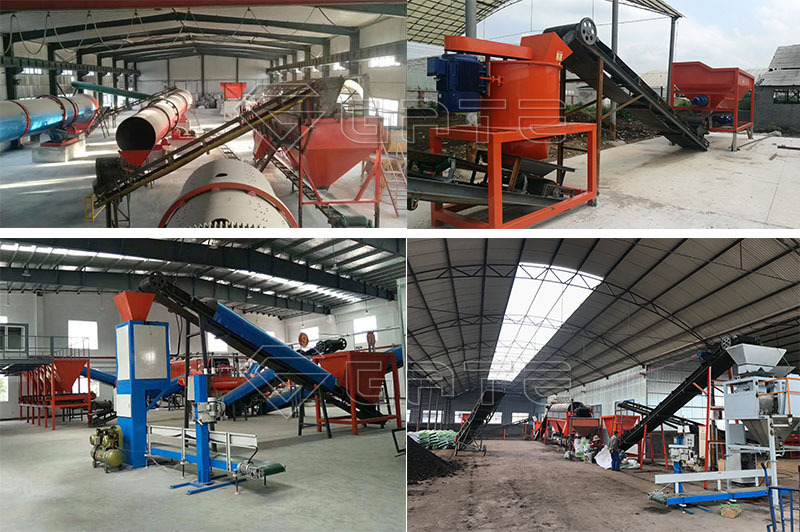 Home » News » how to choose the best chicken manure organic fertilizer granulator machine? GATE fertilizer granulator manufacturing factory provide various chicken manure organic fertilizer granulator machine, You can use new type organic fertilizer granulator machine to make pure organic fertilizer or high qulaity bio/npk organic fertilizer, also, you can sue flat die organic fertilizer granulator or produce cylinder shape organic fertilizer, while the roller press granulator machine is applicable for producing compound npk fertilizer. Organic fertilizer granulator machine is a key fertilizer equipment in the organic fertilizer production line, the fertilizer granulator machine is used for making organic fertilizer pellet, the granulator machine for fertilizer mainly includes organic fertilizer mixing granulator, new type orgnaic fertilizer granulator, disc granulator or pan granulator, flat die granulator. Organic Fertilizer Mixing Granulator is also called wet fertilizer granulator or stirring tooth granulator. It can not only granulate a variety of organic matter, but also is especially able to granulate the coarse fiber material that difficult to be granulated by conventional equipment, such as crop straw, wine dregs, mushroom residue, drug residue, animal manure and so on. In addition, Sluge Organic Fertilizer Mixing Granulator also has a good granulation effect on the humic acid, municipal sludge and other similar raw materials. 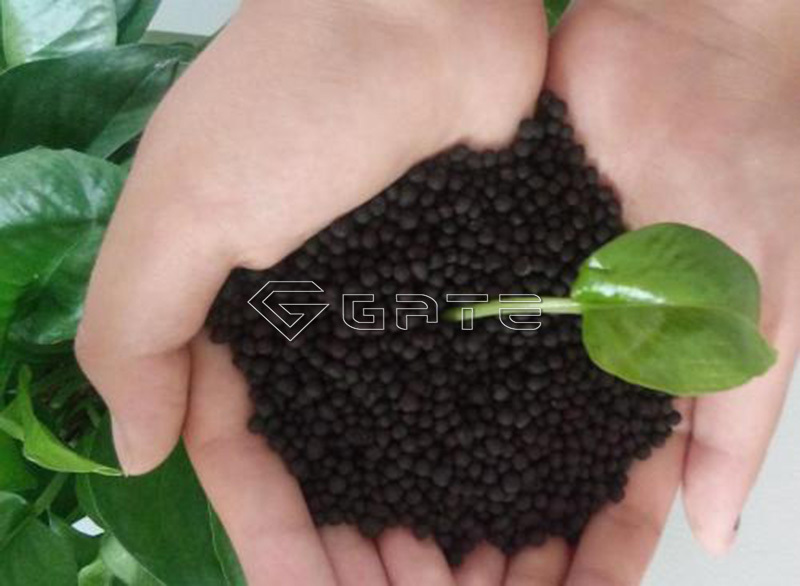 The raw materials need not to be dried before granulation, after screwing, ball shape fertilizers will be out easily. Organic Fertilizer Mixing Granulator Capacity: 1-10 tons per hour . Organic Fertilizer Mixing Granulator Raw Materials: poultry and animal feces manure, carbon black,pottery clay ,kaolin etc. 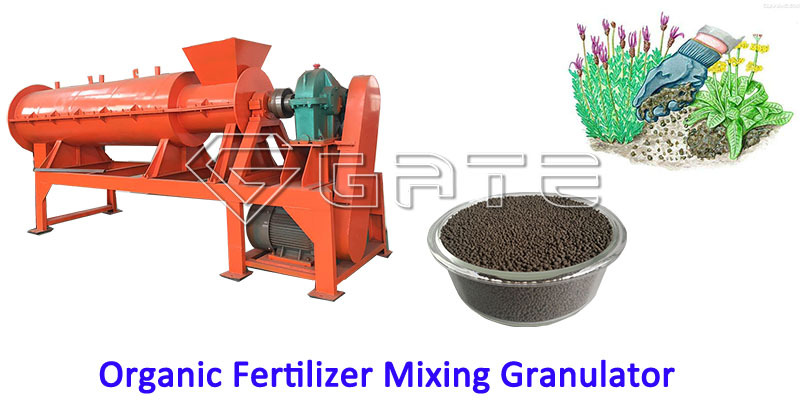 Organic Fertilizer Mixing Granulator Applicated range: organic fertilizer production. No binder need to add, materials inside will grow inlaid with each other under certain force. Chicken Manure Flat Die Granulator is mainly used for granule processing in the (biological) organic fertilizer, fish breeding and poultry raising. And the particles shape of organic fertilizer is cylindrical. 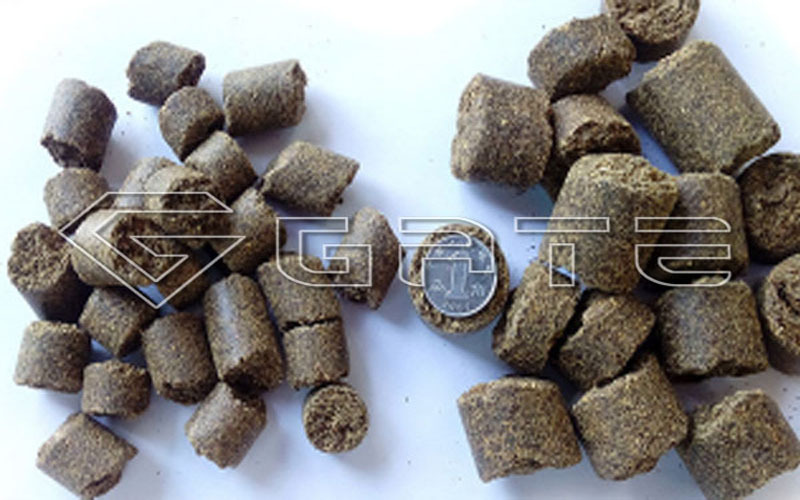 Bio-organic Fertilizer Flat Die Granulator can produce cylindrical granules directly without drying or crushing process which saves a lot of energy. Forming the granules at one time, no returning particles, high granulation ratios. Flat Die Granulator Capacity: 1-5 tons per hour. Flat Die Granulator Raw Materials: animal manure, agricultural wastes, food wastes. 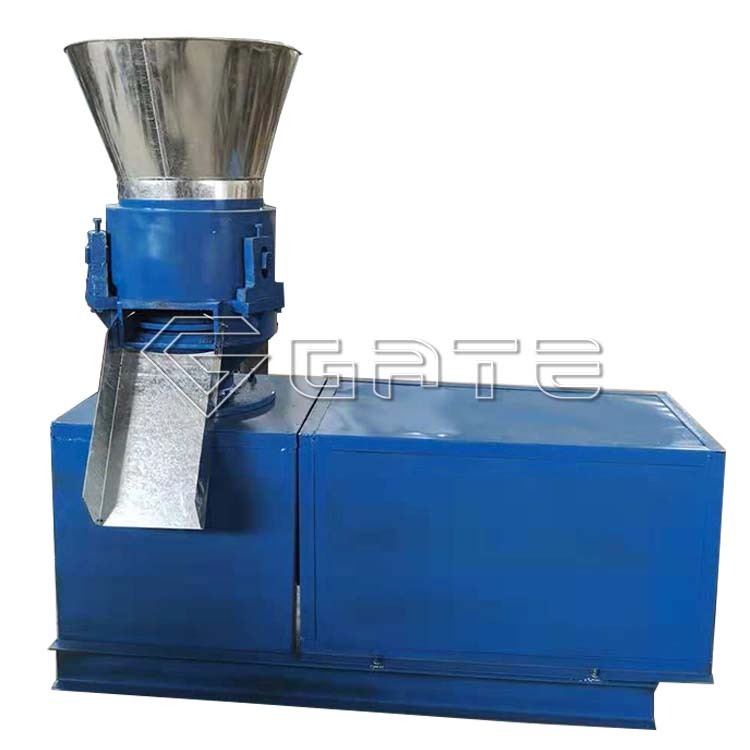 2.One time processing, no need to dry in Animal Feed Flat Die Granulator. 4.Simple operation, easy maintenance and perfect technical design with less labor from Wood Pellet Flat Die Granulator. How To Establish Complete Chicken Manure Organic Fertilizer Production Plant? the moisture of Chicken manure is around 80%, straw moisture content is 10%, after composting water content of chicken manure can be reduced to 30%. The initial water content adjusted to 50-60% is the best. You can calculate the amount of backfill for chicken, manure is33%, chicken manure and accessories ratio is 3: 1. According to the local conditions, you can use straw, corn stalks, peanuts and other organic matter as the auxiliary material. Chicken, duck manure composting fermentation is mainly use biological effects combined with advanced mechanical technology to effectively handling chickens and duck manure. the common process is aerobic fermentation. Using aerobic fermentation method can helt to rise up composting temperature high and fast , maturity cycle is short. Due to its high fermentation temperature, can effectively kill eggs,germs and plant seeds etc. in chicken manure, under the effective mechanical stirring, the drying effect is also very significant. At present, the composting fermentation process commonly used in industry mainly includes the stacker compaction fermentation process and aerobic tank fermentation process. The chicken, duck manure compost in the smooth surface earth in the form of chopped pile. sprinkle with biological fermentation agent. 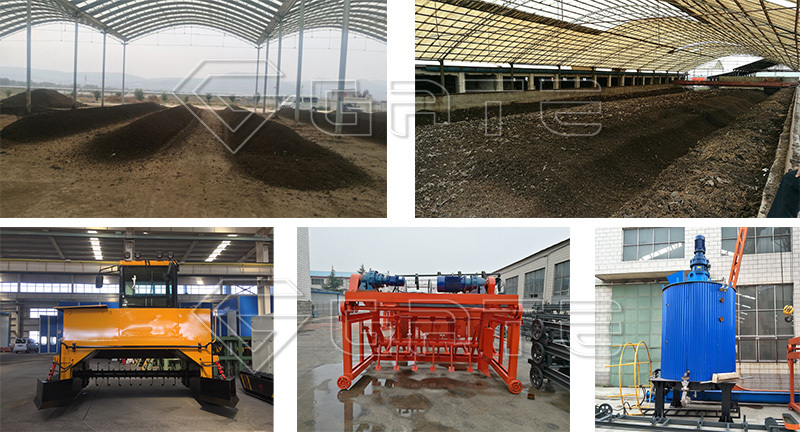 ( directly put the material into the tank if use tank fermentation machine), compost pile width should equal to the equipment width, make the compost plie as high as possible and its length as long as possible, such as 50 meters, 100 meters, the ground to be smooth, concree land or soil land both ok, (as long as the land is smooth with a certain hardness is ok) .to produce 10,000 tons required 5-6 acres land, tank fermentation machine covers an relatively small area. Compost and straw, sawdust and other excipients (moisture content should be 50% -70%), ferment bacteria and other uniform mixing and turn over, 3-5 hours to deodorize, 16 hours warming to 50 degrees, when the temperature reaches 55 degrees, then re-mixing and turning pile and aeration, after that whenever the material temperature reaches 55 degrees,it will start overturning, which is play the role of uniform fermentation, aeration, cooling , repeat the last process until thoroughly decomposed. Chicken manure, duck manure fermentation in summer and autumn, the time control in about 15 days, winter and spring is about 20 days. After the above fermentation process, chicken, duck manure has basically decomposed. Come out of the fermentation tank, stacked in the warehouse for about 10 days will be fully cooked. This chicken, duck manure entire harmlessly process is over. Powder chicken, duck made of organic fertilizer is done. If you want to make granulated fertilizer , you need to increase the organic fertilizer granulator, crusher, screening machine, dryer, cooler, automatic packaging machines, belt conveyors and other equipment. Completely fermented decomposed chicken manure by conveyor into the crusher smashing, the fineness of 80 mesh material accounted for more than 65%, through the conveyor belt into the organic raw material warehouse, after electronic measurement with other raw materials (NPK) into the raw materials Crusher for the secondary crushing and mixing, crushing and mixing the material through the belt conveyor into the drum granulator, in the case of adding water and steam, the raw material temperature is raised, the material itself Viscous is excited, under the function of continuous rolling, the material gradually rolling into a ball, finally outflow at the rear ,pellets send feed into disc pelletizer by the belt conveyor , at the large disc pelletizer angle, long Within the granulation area, the particles are continuously lifted to a height where the particles continuously roll off under the action of gravity. The strength of the particles is further strengthened and the appearance of the granules is more rounded. As the particles in the disc granulator gradually increase, Overflow pelletizing plate,send into the dryer through belt conveyor, hot air of hot air stove induced to dryer ,which contact with organic fertilizer particles and its Moisture is quickly switched out, a large amount of vapor is introduced into the dust collector,after remove dust and water washing treatment,release to the air.